While vacationing in Hawaii recently I was contacted by a developer named Peter who had some iOS programming questions for me. Peter’s background is in WPF, just like me, and he is now moving into iOS programming (welcome to the club!). I replied letting him know that I would answer his questions once I returned to the mainland, what Hawaiians call the rest of the U.S.
Peter’s questions resonated with me. They were things that I, too, was unsure about when I first got into iOS programming, years ago. I assume that these questions must arise for many WPF developers getting into iOS, so I am sharing my reply to Peter here, for the benefit of others. I’ll start off by saying that my book iOS Programming for .NET Developers addresses what you’re asking about (and a whole lot more), so I’ll summarize here. You can read the book for more detail and background. Unlike XAML technologies, which rely heavily on vector-based UI elements to replace a control’s UI, iOS views are quite often styled/customized with images. Styling can be done in code by directly setting properties on a UIView, or via appearance proxies, which is conceptually similar to the WPF styling system. That approach is somewhat limited in terms of what can be adjusted and how drastically. For example, you can use an appearance proxy to set a tintColor property on all UIButtons, but that just introduces a custom color into Apple’s color computation code. If you want to radically change the visual style of a UIButton, an image is the way to go. I also felt the use of images was “wrong” at first, after so many years working with custom data/control templates, but I quickly got used to it. I don’t see the reliance on images to be a shortcoming, it’s actually a lot easier, assuming someone on your team is capable of producing attractive images. I do most of an app’s styling in code, since app-specific styles use shared colors and resizable images defined in code. For one-off images in some UIView there is no reason not to apply them using Interface Builder, unless you prefer to keep all styling in code. UIView is more akin to WPF’s UIElement than Border. UIView is the base class for all UIKit objects shown on an iPhone or iPad screen. It does not have a default appearance, but it does support having children (known as subviews) whose frames are relative to the top-left corner of the parent UIView. This is very similar to the visual tree concept in WPF. I wouldn’t say a screen/page is “littered” with UIViews. That’s like saying that a forest is littered with trees. Read Apple’s View Programming Guide for iOS to get a quick introduction. Layout was based on frames (a.k.a. rectangles) and auto-resizing (a.k.a. springs and struts) until iOS 6 came out. Now we have AutoLayout, which I wrote an introduction about here. AutoLayout uses a system of constraints to define the layout logic for a set of UIViews, and reduces/eliminates the need for hard-coded frames. The downside of AutoLayout is that it can get pretty complicated for non-trivial views, and throws errors if the set of constraints you specify is incomplete or invalid. Personally, I still use auto-resizing with frames, mostly because the projects I’m working on need to support iOS 5.1 and greater, so AutoLayout is not an option. I find working with AutoLayout in Interface Builder to be something like building a house of cards; it’s too easy to accidentally mess it up with a flick of the wrist. Some people think AutoLayout is great, though, so maybe they know something I don’t. I hope this has been helpful for you. It takes a while, but eventually the iOS way of doing things feels just as natural as the WPF way. 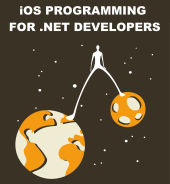 This entry was posted in iOS Programming for .NET Developers, Tips and Tricks. Bookmark the permalink. You’re welcome. Thanks for the great questions, Peter. I too have jumped the Microsoft .NET ship into iOS development. 20 years of Microsoft development experience, 1 year of iOS/Apple experience. At least I know that Apple won’t up and abandon its latest technology, making the last five years of work experience worthless (i.e. WPF, Silverlight, etc. ).